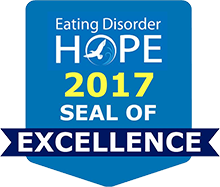 Dr. Gaudiani lectures nationally and internationally on the topic of medical complications of eating disorders. One of Dr. Gaudiani's great passions is to improve the level of medical care for adults with eating disorders across the country. To this end, since 2009, she has spoken at national and regional conferences for top eating disorder associations, such as the International Association of Eating Disorders Professionals (iaedp), National Eating Disorder Association (NEDA), and Academy of Eating Disorders (AED). She was the invited speaker for the Australian and New Zealand Academy of Eating Disorders (ANZAED) in 2013 as their annual guest lecturer, lecturing for several weeks to eating disorder professionals in multiple cities in these two countries. Dr. Gaudiani has presented Grand Rounds at hospitals around the country, most recently giving Pediatric and Psychiatric Grand Rounds at National Children's Hospital in Washington, DC, as the 2016 Silber Lecturer. Dr. Gaudiani is a former board member of iaedp and is currently on the Academy for Eating Disorders' Medical Care Standards committee and the editorial board of the International Journal of Eating Disorders. She is additionally a member of the Advisory Board for Katie H. Wilcox, CEO and Founder of “Healthy is the New Skinny” (www.healthyisthenewskinny.com) and CEO and Founder of Natural Model Management (www.naturalmodelsla.com). She is a member of the EDCare Scientific Advisory Council. To request Dr. Gaudiani's consulting services or invite her to speak, please send an email to info@gaudianiclinic.com. Gastroparesis is felt to be nearly universal in those who have restricted calories resulting in significant weight loss (generally 10-20% of body weight). (1) It is worth emphasizing that gastroparesis can occur in those of all body shapes and sizes and one does not need to be clinically underweight to develop gastroparesis. (2) The most common symptoms are early satiety (meaning feeling very full even after just a small amount of food) and bloating. For those with an eating disorder, specifically those who have body image concerns that focus on the appearance of their abdomen, a distended and bloated stomach can certainly challenge even the most recovery motivated person. It was OCD Awareness Week last week. It was timely that the Sunday, October 7th evening broadcast of “60 Minutes” featured an interview with John Green, author of The Fault in Our Stars. Before the interview, I only knew that he was a good writer, and that he has a great sense of humor. What I didn’t know, before this interview, was that he suffers from OCD as does approximately two percent of the population. Often, when we think of OCD, we imagine an individual who is incessantly washing hands due to contamination fears or flipping a light switch eight times to ward off a disaster of some type. However, there are many ways OCD can show up and affect a person’s life. Iron deficiency is common in athletes. Nearly half of females who exercise may experience iron deficiency.1 While females are at higher risk for iron deficiency due to monthly loss of blood with menstruation, male athletes can also suffer from it. The International Olympic Committee 2009 Consensus Statement on periodic health evaluation of elite athletes even recommended routine screening for iron deficiency.2 Please note, unless otherwise specified, the term iron deficiency in this article solely refers to low iron and not resultant anemia, or low red blood cells. This article is also focused on adult athletes and the information discussed may not apply to children. On numerous occasions over the 14 years that I have helped my clients with their psychological challenges, I have had many arrive at intake confused by what has been suggested as the problem area by well-meaning family, friends and other professionals. This has been especially true when symptoms overlap in multiple problem areas, looking like one thing and being quite another. Illness cannot always be measured, and neither can wellness. This is one of the great medical challenges facing those with eating disorders, where often the act of measuring becomes the obsessive focus of life: how many calories/miles/pounds/steps? Unfortunately, the Western medical system—of which I am a proud member, even while realizing its limitations—further puts the focus on measurables. In our strained system, patients can get triaged into “ok” vs. “sick” based on numbers that may have little to do with their overall suffering. No one would question that certain measurable values carry clear and present danger: an abnormal potassium level, sodium level, bicarbonate level, measure of kidney or liver function, or a very low body weight. We are grateful to Carolyn Costin for this wonderful post! Thanksgiving is such a good marker of time and measurer of recovery growth. I can’t remember how bad my eating was on April 5, 1977 or June 14, 1978, but I can remember what I ate on November 24, 1979 at Thanksgiving because it was the first time I was able to eat Thanksgiving dinner and be okay, really okay about it. And every Thanksgiving dinner after that for a long time kept getting better. In some ways that is still true because it is such a great marker for me to go inside and remind myself about where I have come from and how very very hard it used to be. Gaudiani JL, Chu ES, Mehler PS. Clinical issues encountered in the refeeding of the patient with anorexia nervosa. Current Nutrition and Food Science 2009;5(1):13-16. Narayanan V, Gaudiani JL, Mehler PS. Serum albumin levels may not correlate with weight status in severe anorexia nervosa. Eating Disorders 2009;17:322-326. Mehler PS, Winkleman A, Andersen D, Gaudiani JL. Nutritional rehabilitation: Practical guidelines for refeeding the anorectic patient. Journal of Nutrition and Metabolism 2010. Article ID 625782. Epub 2010 Feb.
Biffl WL. Narayanan V. Gaudiani JL. Mehler PS. The management of pneumothorax in a patient with anorexia nervosa: case report and review of the literature. Patient Safety in Surgery 2010, 4(1):1. Cleary BS. Gaudiani JL. Mehler PS. Interpreting the Complete Blood Count in Anorexia Nervosa. Eat Disord 2010; 18(2): 132-139. Gaudiani JL, Kashuk JL, Chu ES, Narayanan V, Mehler PS. The use of thrombelastography to determine coagulation status in severe anorexia nervosa: A case series. Int J Eat Disord 2010;43(4):382-385. Narayanan V, Gaudiani JL, Harris RH, Mehler PS. Liver function test abnormalities in anorexia nervosa—Cause or effect. Int J Eat Disord 2010;43(4): 378-381. Gaudiani JL. Heinrichs G. Narayanan V. Mehler PS. Tampon use in patients with anorexia nervosa can cause persistent vaginal bleeding: a case series. Int J Eat Disord 2011; 44(8): 752-55. Mehler PS. Cleary BS. Gaudiani JL. Osteoporosis in anorexia nervosa. Eat Disord 2011;19(2):194-202. Bapoje SR. Gaudiani JL. Narayanan V. Albert RK. Unplanned transfers to a medical intensive care unit: Causes and relationship to preventable errors in care. J Hosp Med 2011;6(2):68-72. Flierl MA. Gaudiani JL. Long CS. Stahel PF. Mehler PS. Complement activation in patients with anorexia nervosa: a new biomarker for severe disease. Annals Gen Psych 2011. 10(16). Gaudiani JL. Sabel AL. Mascolo M. Mehler PS. Severe anorexia nervosa: Outcomes from a medical stabilization unit. Int J Eat Disord 2012; 45(1):85-92. Bahia A. Mascolo M. Gaudiani JL. Mehler PS. Pseudobartter syndrome in eating disorders. Int J Eat Disord 2012; 45(1):150-153. Krantz MJ, Sagar UN, Long CS, Barbey JT, Gaudiani JL, Sabel A, Mehler PS. Factors influencing QT prolongation in patients hospitalized with severe anorexia nervosa. Gen Hosp Psych 2012; 34(2): 173-7. Krantz MJ. Gaudiani JL. Johnson VW. Mehler PS. Exercise electrocardiography extinguishes persistent junctional rhythm in a patient with severe anorexia nervosa. Cardiology 2011;120:217-220. Gaudiani JL. Braverman JM. Mascolo M. Mehler PS. Ophthalmic changes in severe anorexia nervosa: A case series. IJED 2012; 45(5): 719-21. Chu ES. Gaudiani JL. Mascolo M. Statland B. Sabel A. Carroll K. Mehler PS. ACUTE Center for Eating Disorders. J Hosp Med 2012;7(4): 340-44. Sabel AL. Gaudiani JL. Statland B. Mehler PS. Hematologic abnormalities in severe anorexia nervosa. Ann Hematol 2013; 92(5):605-13. Kosmiski L, Schmiege SJ, Mascolo M, Gaudiani J, Mehler PS. Chronic starvation secondary to anorexia nervosa is associated with adaptive suppression of resting energy expenditure. J Clin Endocrinol Metab 2014;99:908-14. Bennett SL. Gaudiani JL. Brinton JT. Mehler PS. Motivated to survive: High cooperativeness in severe anorexia nervosa. Eat Disord 2015. Mar 31:1-9 Epub. Brown C. Sabel AL. Gaudiani JL. Mehler PS. Predictors of hypophosphatemia during refeeding of patients with severe anorexia nervosa. Int J Eat Disord 2015. In press. Gaudiani JL. Brinton JT. Sabel AL. Rylander M. Catanach B. Mehler PS. Medical outcomes for adults hospitalized with severe anorexia nervosa: An analysis by age group. Int J Eat Disord 2015. In Press. Rosen E. Sabel AL. Brinton JT. Catanach B. Gaudiani JL. Mehler PS. Liver dysfunction in patients with severe anorexia nervosa. Int J Eat Disord 2015. In press. Holmes SRM, Sabel AL, Gaudiani JL, Gudridge T, Brinton JT, Mehler PS. (2016). Prevalence and Management of Oropharyngeal Dysphagia in Patients with Severe Anorexia Nervosa: A Large Retrospective Review. Int J Eat Disord. 49(2):159-166. Gaudiani JL. Mehler PS. Rare medical manifestations of severe restricting and purging: “Zebras,” missed diagnoses, and best practices. Int J Eat Disord 2015. In press. 2015 Invited chapter: Encyclopedia of Feeding and Eating Disorders: Medical Complications in Adults, including pregnancy, published by Meteor Springer. Due October 2017.